Our last 2 nights at Bali were spent at the established Diwangkara Holiday Villa, Sanur. It's on a different side of the beach at Bali, one where it's less crowded compared to the famous Kuta beach (I actually didn't get to visit Kuta beach during this trip!). We had our 'welcome drink', a fruit-punch, which I felt was too sweet, before calling it a night. There was still day 4 to be excited about! I journeyed through this area alone as my mum wasn't feeling too well & my sister wasn't interested in visiting more temples. In fact, I didn't really visit the temple, but spent more time just enjoying the breeze on the cliffs! Puts me to awe at how God created such fantastic artwork for us to enjoy! According to the ticketing officers/lady who tied my 'sarong', I've to be very careful with the many monkeys roaming around the temple area. Thankfully there weren't THAT many wild monkeys around since I was walking alone. They were only at ONE specific area & not popping out from trees randomly (to scare any visitors that they want to). After much sunburn, we left the Uluwatu Temple area for Padang-Padang beach, which was on the way back to town. According to our driver, Komang, this beach is far better than Dreamland Beach as it's not as commercialized. The waves here are also bigger, so it's a surfers' paradise! Everyone has to walk through a flight of stairs through a cave to get to the beach. Quite some walk on a steep, narrow path. Pretty waves...good place to sun-bath! We didn't spend a very long time at this beach as we had to head to our next destination/appointment i.e. 3 hours spa at Murano Spa, Seminyak. Bottom line, we were TOTALLY SATISFIED! 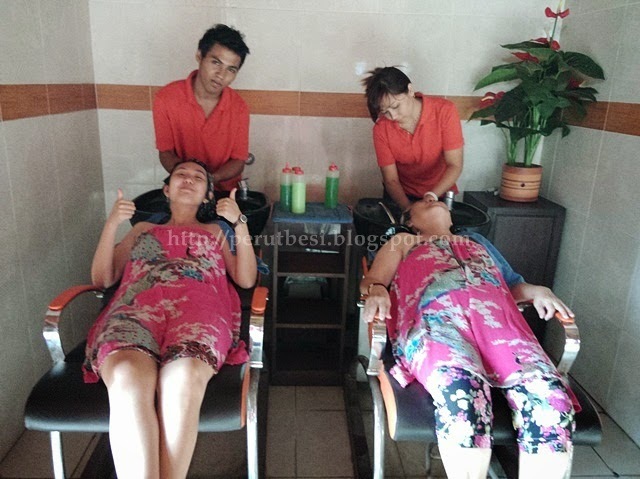 There are just too many massage parlours & spa centers in Bali, so going through the long list of recommended places was surely a challenge, which of course I took up. After much consideration, filtration & research, I decided on Package 4 from Murano Spa. Enjoy a relaxing Deep Tissue massage with Sandalwood or Frangipani mint oil to relieve pain, tension and improve blood circulation. This includes: cleansing, peeling, steam treatment, a traditional Indonesian facemask and a rejuvenating face, neck & shoulder massage. This includes: a shampoo wash , scalp massage with soothing cream, steam treatment, tonic, and a relaxing head, neck & shoulder massage. It's a true pampering session for us ladies :) A much-deserved one after 3 days of sight-seeing & walking. After applying a generous portion of 'cream'/hair mask on my scalp, I had the steam treatment to ensure that the roots of my hair absorbs all the goodness of the cream. Oolala...VERY syiok! Even at 6:15am in the morning, the sky was quite bright & many people were already at the beach. Thank You, Lord, for the beautiful sunrise on my 1st time in Bali! It was indeed a good sight-seeing & pampering trip. Although most places are quite far to travel, I thank God for the experience to witness His creation in Bali. 'Til we meet again, Bali! I'll miss you! Up next will be my post on FOOD experienced at Bali!! :D Stay tuned!